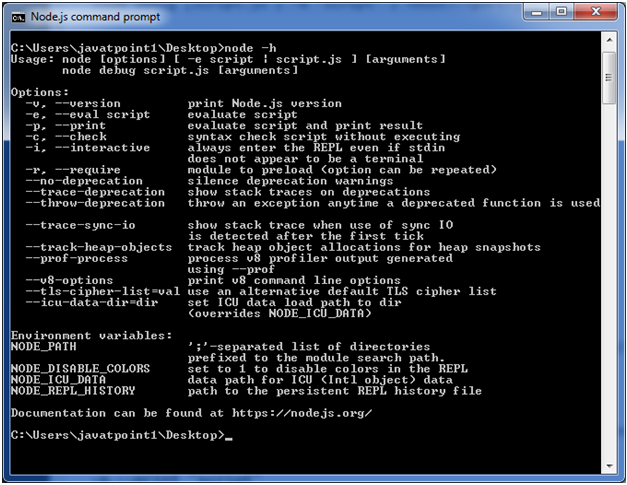 There is a wide variety of command line options in Node.js. These options provide multiple ways to execute scripts and other helpful run-time options. 1. v, --version It is used to print node's version. 2. -h, --help It is used to print node command line options. 4. -p, --print "script" It is identical to -e but prints the result. 5. -c, --check Syntax check the script without executing. 6. -i, --interactive It opens the REPL even if stdin does not appear to be a terminal. 7. -r, --require module It is used to preload the specified module at startup. It follows require()'s module resolution rules. Module may be either a path to a file, or a node module name. 8. --no-deprecation Silence deprecation warnings. 9. --trace-deprecation It is used to print stack traces for deprecations. 10. --throw-deprecation It throws errors for deprecations. 11. --no-warnings It silence all process warnings (including deprecations). 12. --trace-warnings It prints stack traces for process warnings (including deprecations). 13. --trace-sync-io It prints a stack trace whenever synchronous i/o is detected after the first turn of the event loop. 14. --zero-fill-buffers Automatically zero-fills all newly allocated buffer and slowbuffer instances. 15. --track-heap-objects It tracks heap object allocations for heap snapshots. 16. --prof-process It processes V8 profiler output generated using the v8 option --prof.
17. --V8-options It prints V8 command line options. Use command node -e, --eval "script"
Use command node -p "script"